ThrowbackHannah Montana’s Boyfriends: Where Are They Now? You guys are not going to believe this, but today, Jan. 16, 2019, marks the eight year anniversary since Hannah Montana ended. Wow! Can you believe how fast time flies? Since the show came to an end, so many of the stars went on to act in a ton of movies and TV shows. 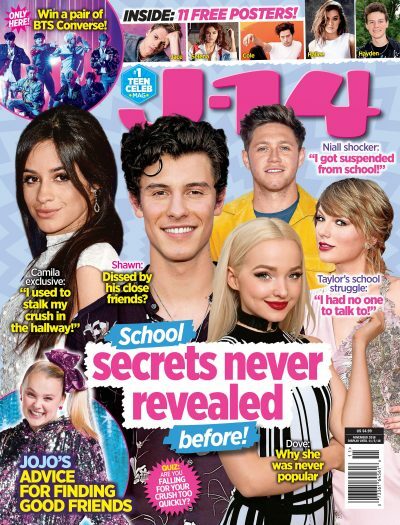 As J-14 readers know, Miley Cyrus, for example, became one of the biggest names in Hollywood — releasing five studio albums over the last eight years and starring in a few movies, including The Last Song, where she met her husband Liam Hemsworth. But some decided to leave the spotlight, like Emily Osment, for example, who actually took some time off to got to college! But what about Miley’s love interests? During the epic Disney Channel show, Miley was paired with some pretty interesting guys. And in honor of the anniversary, we decided to do some investigating and find out what they’re all up to now! Scroll through our gallery to see what all Miley’s boyfriends from Hannah Montana are doing now. Lucas Till played Travis Brody. Scroll to see what he’s is doing now. Where is Lucas Till now? Lucas played Miley’s childhood friend and love interest in Hannah Montana: The Movie. And afterwards, the actor went on to star as Havok in the X-Men series! He’s currently playing the title character in CBS’ action series MacGyver, but you may also recognize him from his appearance in Taylor Swift‘s “You Belong With Me” music video! Where is Drew Roy now? Can you believe how different Drew looks? The actor has certainly grown up since his time on Hannah Montana, and get this — he even became a dad! Drew got married to his long time girlfriend Renee Gardner in 2015, and the couple welcomed a son, Jack, in 2017! But besides starting a family, he’s also continued to act. He starred in the TV shows Falling Skies and The Last Ship, plus, he appeared in the 2016 flick Sugar Mountain. Cody Linley played Jake Ryan. Where is Cody Linley now? Cody may always be Jake Ryan in our hearts, but that didn’t stop him from going on to star in a ton of other roles. He went on to act in a few episodes of Melissa & Joey, and he also starred in the movies My Dog The Champion, Hoovey, and Sharknado 4 and 5. Cody was also a contestant on the seventh season of Dancing With The Stars, in which he was partnered with Julianne Hough and finished in fourth. But that’s not all, because the actor even released his own album in 2012. So yeah, he definitely has not slowed down. Corbin Bleu played Johnny Collins. Where is Corbin Bleu now? Who remembers the episode of Hannah Montana where Johnny paid $19,000 to go on a date with Hannah? Well, since then, Corbin, who you might also recognize from his role as Chad in High School Musical, has done a lot. He went on to star in One Life To Live, the horror flick Scary Or Die, Sugar, To Write Love In Your Arms (which also starred Chad Michael Murray), and more! The list seriously goes on and on. He has also pursued a music career and has released two studio albums over the years. Not to mention, the actor even starred in the Broadway production of In the Heights back in 2010! Corbin also got married to actress Sasha Clements in 2016. Where is Moises Arias now? There was no secret that Rico had a huge crush on Miley in Hannah Montana, but since the show, the actor that played him has had a major glo’ up. Moises went on to star in the ABC show The Middle, Enders Game (which co-starred Hailee Steinfeld), The Kings Of Summer (which also starred Nick Robinson), Pitch Perfect 3, and Jean-Claude Van Johnson — just to name a few. Plus, he was the voice of Antonio in Despicable Me 2! The actor has also recently gotten involved in photography, and has even shot some major celebs — like Kendall Jenner and Bella Hadid for example. Where is Jesse McCartney now? Jesse guest-starred on the show as himself, and it was no secret that Miley had a total crush on him in the show. But what has he done since then? He appeared in shows like Law & Order: SVU, Summerland, and Greek. Plus, he even lent his voice to the Alvin & The Chipmunks movies, where he played Theodore! But Jesse’s main focus has been singing. He’s released six studio albums over the years, and he’s still taking the stage to belt out his iconic hits! That’s right, the singer just wrapped up his 2018 Resolution Tour. Where is Austin Butler now? It looks like Austin is having better luck in his dating life than his character did (in the show, Miley described Derek as her worst date ever!) since he has been dating Vanessa Hudgens for a while now, and they could not be cuter. As for his career, he went on to star as James Garrett in Zoey 101! After that, you might recognize him from his roles in Ruby & the Rockits, Life Unexpected, Switched at Birth, and The Carrie Diaries.